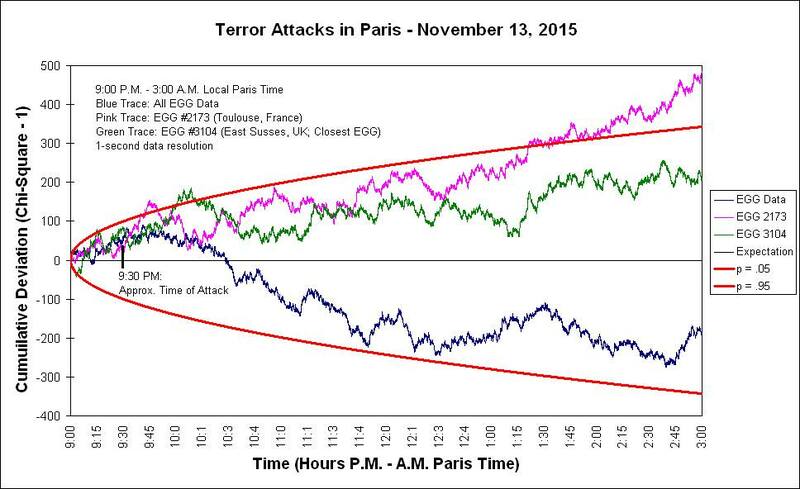 Late on the 13th of November, 2015, Paris suffered agonizing terrorist attacks in several places, roughly at the same time beginning around 9 or 9:30. Gunmen entered a restaurant an sprayed customers with AK-47 fire, killing several. Two or more bombs, apparently suicide vests, exploded outside a soccer stadium, and a team of murderous and suicidal men killed more than 100 people in a rock concert hall, the Bataclan. Shock and dismay were felt around the world. The NY Times reported that the most deaths appear to have occurred at The Bataclan, a popular concert venue. At approximately 9:30 p.m., several armed individuals entered and began shooting for about 10 minutes. At around 10 p.m., the gunmen began taking hostages. French media quoted officials saying that about 100 people were killed here. French police entered and killed 3 or 4 terrorists, ending this tragic moment. The event was analysed by Bryan Williams, who looked at eggs which were closest to Paris. His description and the resulting graph are shown below. The GCP event was set to begin 13th Nov at 9pm local time for 6 hours, which is 20:00 on the 13th to 02:00 14th, UTC. This probably includes half an hour before the time of the Bataclan invasion. I was unable to get accurate times for the other attacks. The result is Chisquare 21418.581 on 21600 df, for p = 0.808 and Z = -0.872. Here's a graph of the data from the Global Consciousness Project's worldwide network of RNGs (called "EGGs") which corresponds to the horrific attacks that occurred in Paris, France last evening. The trace for all the EGGs (in blue) compliments the formal GCP result (http://www.global-mind.org/events/paris.terror.html). The graph also shows the output from one of the EGGs in France (EGG 2173, located in the city of Toulouse to the south), as well as the closest EGG to Paris at the time (EGG 3104, located in East Susses, UK, along the English Channel). (Unfortunately, the EGG located directly in Paris does not appear to have been active at the time.) It is rather intriguing to see that the Toulouse EGG (in pink) showed a significant positive deviation from chance (Chi-Square = 22082.60, 21600 df, p = .01, associated z = 2.312). While we can't know for sure whether this was a possible "group consciousness" effect or an expected chance fluctuation in the data, it does look interesting from an aesthetic perspective. Here's offering hope for the people of Paris.